The Dutch artist was born 1921 in Amsterdam. He studied from 1942 to 1944 at the Imperial Academy Appel in Amsterdam which was during the period of occupation of Holland by Germany (1940 – 1944). There he met Corneille and Constant. His first solo exhibition was in 1946 at the Het Heerenhuis and a short time later, he was part of the group exhibitions Jonge Schilders (Young Painters) at the Stedelijk Museum in Amsterdam. At this time he was influenced by Pablo Picasso, Henri Matisse and Jean Dubuffet. 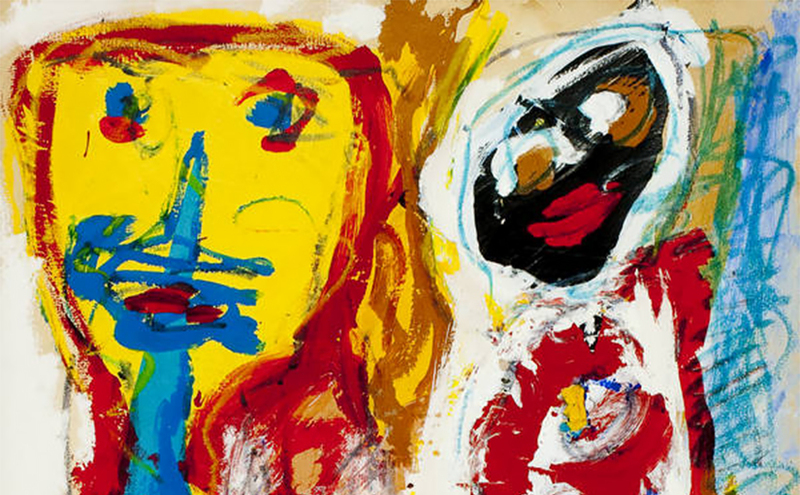 In 1948 he founded with Corneille and Constant, the Netherlands Experimental Group and In the same year he founded with the same and with other artists, the artist group CoBrA. CoBrA art was not very popular in Amsterdam at that time, but in Denmark since the Danish made Spontaneous Art already since 1939. In 1949, the Stedelijk Museum in Amsterdam had the first CoBrA exhibition which resulted in a big scandal of the press and public and was strongly criticized. In the same year Appel created the painting „Questioning Children“ for the canteen of the townhouse in Amsterdam. The indignation of the employees and the general public was very strong about the painting which reminiscent of a children’s drawing. Therefore the painting was covered for ten years. Because of the rejection of CoBrA art by the population of Amsterdam, he moved to to Paris in 1950. He had his international breakthrough in the mid-50s and around 1990 he had studios in New York, Connecticut, Monaco and Tuscany. Karel Appel died 2006 in Zurich.